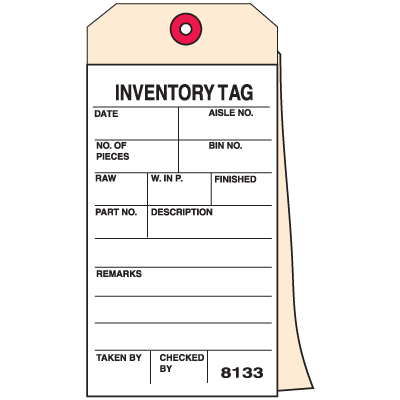 INVENTORY TAG. DATE ____. AISLE NO _____. NO. OF PIECES _____. BIN NO. _____. RAW _____. W. IN P. ______. FINISHED _____. PART NO. _____. DESCRIPTION ______. REMARKS _____. TAKEN BY _____. CHECKED BY _____.